The signficance of why GNM dentist use the Myomonitor Low Frequency TENS (Transcutaneous Neural Stimulation) is a fundamental and clinical understanding of neuromuscular dentistry. Relaxation of hypertonic musculature is a crucial bio-physiologic concept to remove abnormal tension and skews from the mandibular to cranial complex. Prior to any occlusal treatment it is important to establish 6 dimensional muscular balance (homeostasis). Myomonitor stimulates the trigeminal (5th) and facial (7th) cranial nerves every 1.5 seconds (intermittent rythmic pulse) producing what is known as the “myo-trajectory” or neuromuscular trajectory. Relaxed musculature allows the treating clinician to identify an isotonic mandibular closing path (“myo-trajectory”) which is 84.1% of the time anterior to the habitual (pathologic) closing trajectory. 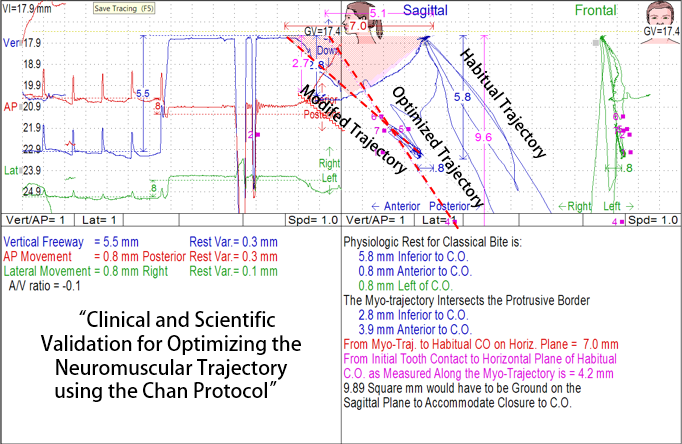 Do you want your dentist to be adjusting or equilibrating your bite (occlusion) on a pathologic strained habitual trajectory closing path or do you want your dentist to be treating your bite on a proper isotonic closing trajectory (“myo-trajectory”)? The K7 kineseograph computerized mandibular scanning (jaw tracking) allows the dentist to visualize the effects of the Myomonitor TENS as well as the different mandibular closing paths. Habitual trajectory – The accommodated mandibular closing path when the patient taps their teeth together. Modified or Myo-trajectory – a more relaxed closing jaw path after 45-60 minutues of Myomonitor TENS. Optimized Trajectory – an isotonic mandibular path of closure when the disc are also reduced. This the jaw position and which the GNM dentist are able to identify and recognize as a more theraputic treatment position. Which trajectory is your dentists establishing your bite/occlusion to help with your treatment?